Get safety training required for your work. Note! You must have a UCSD Business Systems account user name and password to access UC Learning Center. See How to Get Access to UCSD Business Systems for simple instructions. Contact your department security administrator (DSA) if you need assistance. Individual supervisors and principal investigators must identify job-specific hazards and ensure their employees attend safety training appropriate for the work they perform. 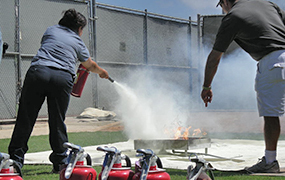 Supervisors, read Safety Training Checklist for Supervisors to learn about your training responsibilities. Log on to UC Learning Center to check schedules, register for instructor-led training or take eCourses. Note! You must have a UCSD Business Systems account user name and password to access UC Learning Center. See How to Get Access to UCSD Business Systems for simple instructions. Contact your department security administrator (DSA) if you need assistance. UC Learning Center – To check schedules and register for training offered through Staff Education & Development, logon to UC Learning Center and use the course catalog or search box to locate the class. About Business Systems Account – You must have a campus-assigned Business Systems account user name and password to register and take training on UC Learning Center. For information on setting up a campus affiliate account for a non-UCSD person, contact your Department Security Administrator (DSA) and ask them to create a Non-UCSD SSO account for the person via UCSD's Affiliate site. Business Systems account through InCommon – UC employees, students, and affiliates with a Business Systems account user name and password can access UC Learning Center through InCommon. See instructions (PDF) for using UC InCommon. Web-Based Training Resources at UCSD – An overview of UCSD's Web-based training and learning resources (also called eCourses or CBT for computer-based training). UCSD Extension: OSHA Training Institute – Training services for health and safety professionals. UC Learning Center – Click on My Training Transcript to see your training history. MyTraining Overview – All UCSD staff and faculty who have taken Staff Education training courses and have an official UCSD e-mail address can use MyTraining to view their own training history. Note: Read About Safety Training for safety training record-keeping requirements.